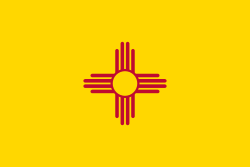 This is a list of law enforcement agencies in the state of New Mexico. According to the US Bureau of Justice Statistics' 2008 Census of State and Local Law Enforcement Agencies, the state had 146 law enforcement agencies employing 5,010 sworn police officers, about 252 for each 100,000 residents. This is almost exactly the national average of policemen to residents in the United States. ^ Goldstein, Richard (22 November 2015). "Bob Foster, Whose Left Hook Decimated All but the Heavyweights, Dies at 76". New York Times. Retrieved 24 November 2015. ^ Stiny, Andy (17 March 2015). "State cop fired over shooting hired as deputy in Taos". Albuquerque Journal. Retrieved 20 March 2015. ^ "Clayton police officer arrested, fired". Connect Armarillo. 13 April 2015. Retrieved 17 April 2015. ^ Last, T.S. (21 February 2015). "Santa Fe, Espanola officers charged by DA; both have worked for current SF chief". Albuquerque Journal. Retrieved 27 February 2015. ^ "Grants Police Department". Grants Police Department. Retrieved 22 May 2015. ^ "Flags at Half-Staff for Navajo Police Officer Alex Yazzie, Killed in the Line of Duty". Indian Country Today. 21 March 2015. ^ "Official Web Site". NMMI. Retrieved 24 November 2015. This page was last edited on 20 April 2019, at 16:05 (UTC).